GO 64 AP Employees Transfers Guidelines 2017 AP Employees General Transfers 2017 Schedule, AP Employees Transfers Schedule, AP State Employees Transfers Rules and Postings 2017 Guidelines and Instructions Released as per GO.No.64 Dt. 21.4.2017. AP Employees Transfers and Postings Guidelines 2017, Employees Transfers Schedule GO 64. Dt. 21.04.2017. Ban lifted on Employees and Teachers Transfers in AP Principles and Procedure Communicated. AP Employees Transfers GO 64 Guidelines 2017 Service years Instructions, AP Employees Transfers 2017 Guidelines G.O Ms.No.64 Dated 20-04-2017 is released by AP State Govt finance department. AP Employees Transfers Ban lifted and relaxation is from 25th April 2017 to 24th May 2017 as per AP G.O Ms.No.64 Dated 20.04.2017. AP Public Services – Human Resources – Transfers and Postings of Employees – Guidelines / Instructions – Orders –Issued. AP GO.64 Transfers and Postings of Employees Guidelines, Instructions GO.64 AP Govt Employees Transfers Minimum 3 Years, Maximum 5 Years Go.64, Transfers and Postings of Employees Guidelines, Instructions has been issued by the AP Government. AP Govt. Employees who has completed 3 years are eligible for regular transfers. The employees who were completed 5 years of service as on 1st June 2017. The relaxation on transfers shall be effective from 24th April, 2017 to 24th May, 2017. All AP Employees transfers shall be done on the basis of performance based counselling in a transparent manner. These Guidelines are applicable for all Departments except Education Department. 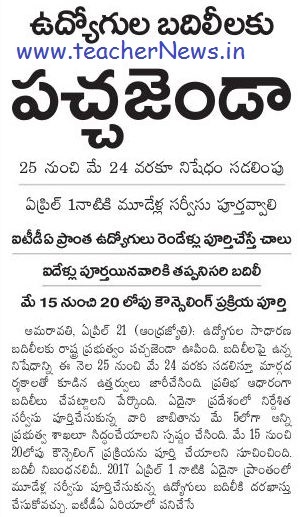 AP Govt Employees Transfers Minumum 3 Years, Maximum 5 Years. a) The relaxation on transfers shall be effective from 25th April,2017 to 24thMay, 2017.
c) All transfers shall be done on the basis of performance based counselling in a transparent manner. Performance Criteria for various categories of employees shall be evolved by the competent authorities. Wherever required, self-appraisal may be obtained quickly from the employees. ii. The department will prepare a list of all employees who have completed five years at a duty station – and two years in ITDA areas – and publish the same on the department’s portal and on its notice board by 2nd May, 2017.
iii. All employees who have completed three years of service at a duty station and satisfy the conditions enumerated at item (iv) of para 3 above, are required to submit applications along with self-appraisal indicating three preferences/options by 2nd May, 2017.
iv. The authority effecting transfers will notify the existing and potential vacancies category-wise by 5th May,2017. v. The employees who are covered in (ii) and (iii) above may submit options from 5thMay,2017 to 10thMay,2017. vi. The competent authority effecting transfers will draw up and publish detailed schedule for counselling for each category indicating the date and time by 11thMay,2017.The slots and the venue for counselling shall be publicised in such a manner that all employees know the slot and venue well in advance enabling them to attend the counselling. vii. The process of counselling shall start on 15thMay, 2017 and be completed in its entirety by 20thMay, 2017.
viii. The vacancies and the preferences / options of employees need to be exhibited at a prominent place in the premises of the office as well as in Departmental web site. ix. The result of counselling viz., the new postings shall be notified on the day following the day of counselling and be displayed on the web portal and / or at a place accessible to every employee. x. All transfer orders will be issued by the competent authority on or before 24th May, 2017. The entire transfer process will cease at 12 A.M. on 25th May,2017. e) The Head of the Department concerned is responsible for the implementation of the transfer orders in the most transparent manner possible without giving any scope for complaints / allegations. Any violation of these guidelines will be viewed seriously by the Government. GO 64 AP Employees Transfers Schedule, Employees Transfers Guidelines 2017, AP Transfers GO 64. Dt. 21.04.2017. Guidelines of AP Employees Transfers 2017, Rules for Andhra Pradesh Employees Transfers 2017. The relaxation on transfers shall be effective from 25th April, 2017 to 24th May, 2017.